This is a city that never says no, which is good news for brides and grooms who think for themselves. 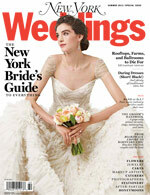 No matter how cliché-subverting your nuptial vision may be, New York has the resources you need to pull it off. This issue is packed with original ideas to help you get started, from gutsy gowns and convention-defying flowers to double-take cakes and nouveau cocktail pairings. You’ll also find the unique wedding albums of five couples who did it their way—proof that there’s no better place than right here to let your imagination run wild. On the Cover: Photograph by Andrew Eccles for New York Magazine. Styling by Ise White for Artists by Timothy Priano. Market by MaryKate Boylan. Hair by Ryan Cotton for Jed Root, Inc. Makeup by Quinn Murphy for Chanel/Artists by Timothy Priano. Fashion Assistant: Mickey Woods. My Beloved embroidered tulle gown by Reem Acra, $13,000; French birdcage veil with crystals by Leah C. Couture Millinery, $325; Elsa Peretti Diamonds by the Yard platinum necklace, $18,500 at Tiffany & Co.; 3-carat cushion-cut diamond ring, 10-carat round-diamond bracelet, and 5.75-carat diamond earrings, all by Kwiat, prices upon request. David Austin garden rose, tulip, and ranunculus bouquet by Allow Me Event Design, $200. The season's most inspired gowns dare to be remembered. The new genus of table topper is anything but predictable. When choosing a meal plan, you can go formal or familiar. Just do it with a twist. Museum-worthy creations for appreciators of both contemporary and classical cake art. Browse 110 wedding dresses from non-traditional suits to vintage-inspired. Graphic prints, plaids, and more options for the groom. Tiny bags for a big day. Every neckline has its necklace. Channel your inner wood nymph instead. A quartet of stylists gussy up a budget gown, with a little help from two hair and makeup pros. Not every wedding crasher is unwelcome. Here, eight couples' chance encounters and the strangers who made them memorable. Ruby Sheng and Jason Nichols's speakeasy soirée. Carla Schmidt and Mark Silk's Etsy-eclectic fête. Caroline De Sousa and Zak Mascolo's coolly coiffed family affair. Emily Kollars and Annabelle Rinehart's color-coordinated dinner party. Charlotte Adams and Max Bertz's barnyard bacchanal. Head-to-toe fixer-uppers for the makeover-minded bride. Punchy colors and bold typography set this stationery apart from the rest of the mailbag. How one couple made it work when everything went wrong. And five other new-wave crazes creeping onto the radars of wedding bloggers. Ten open-air venues, each with a plan B interior option should the weather act up. The savvy way to wed in a city park. Idyllic farmhouse properties within striking distance of Manhattan. Cocktail hour is a time to experiment. It’s a conundrum for the ages. To settle the score, we liquored up two seasoned D.J.’s and two veteran band leaders and let them take it to the mats. Eight music acts guaranteed to pack a dance floor. An old superstition still inspires healthy competition. Eight late-night options for post-reception high jinks. Most newlyweds take to the mike at some point during their nuptials, often delivering overly sappy soliloquies. Don’t be that couple. This fill-in-the-blank outline will keep you on track. The band for the modern groom. Grown-up gifts for grown-up groomsmen. Some grooms aren’t content being spectators. Meet three locals with a nuptial specialty. Bragging rights without the shame. Eight confections designed with specific fiancés in mind. Win-win trips for couples with different ideas of what it means to vacation. Luxury takes on tired old travelogues. Philanthropic journeys for selfless newlyweds.